Social media optimization starts with timing. You can create and share the greatest content in the world - but if no one is seeing it, it might as well be invisible. Timing is critical for engagement and a successful social media strategy, and we have the best times to post right here in our social media planning template. The purpose of social media is to create a community and build awareness around your brand. You want to post content when your audience is present. If no one is there to see your posts or read them, you won’t receive the interaction you’re looking for. Since every social media channel is different, finding the most opportune time to post may take some experimenting. A great way to discover the best time for optimum engagement is by testing frequency and timing of your posts. Try posting at different times and on different days; keep track of the analytics and monitor engagement. Record which posts are doing the best and receiving the highest amount of engagement. Another reliable way to determine optimum engagement is by exporting the last six months of your Facebook Insights, then study them to see what has been working well for your page. 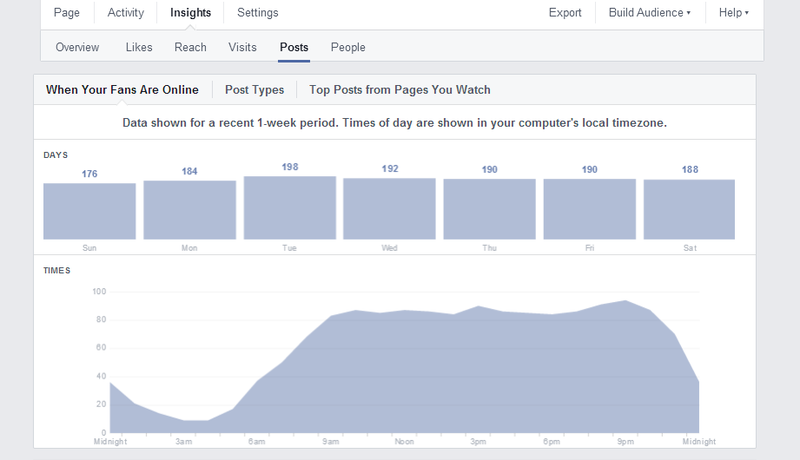 Facebook insights will provide a graph of your best times; often resembles a whale. From this graph you can determine your best days of the week and time of day for posting. Most social media channels can provide some type of analytics for monitoring engagement and post rates. If you use social media management software, you can export extensive data about your posts and audience. Audiences vary across social media channels and from industry to industry. Some want to be reached in their off hours, others engage at lunch on their smartphones. The quality and the type of content also influences engagement. Keep in mind time different time zones. If you’re an international company, your followers may have a 12 hour time difference. Your target audience may be online when you’re not; scheduling posts to go out at certain times will allow you to reach them. These optimization tips will improve the engagement between you and your best customers.